LZZR Reck Jewelry Line Has Launched – Catch it! The LZZR Reck jewelry collection is rich with clean architectural lines, purposeful spaces, subtle raw textures, and an organic sensibility only the delicate touch of an artist’s hand and eye can render. Each piece conceived of, carved and fabricated by Lizz Roberts is simultaneously streamlined, industrious and luscious. From her finger tip rings, dangling earings and bracelets, to her long layered or singular pendents that cut a dramatic line down the front of a bodice, her work is inventive and yet reminiscent of artistic influence. 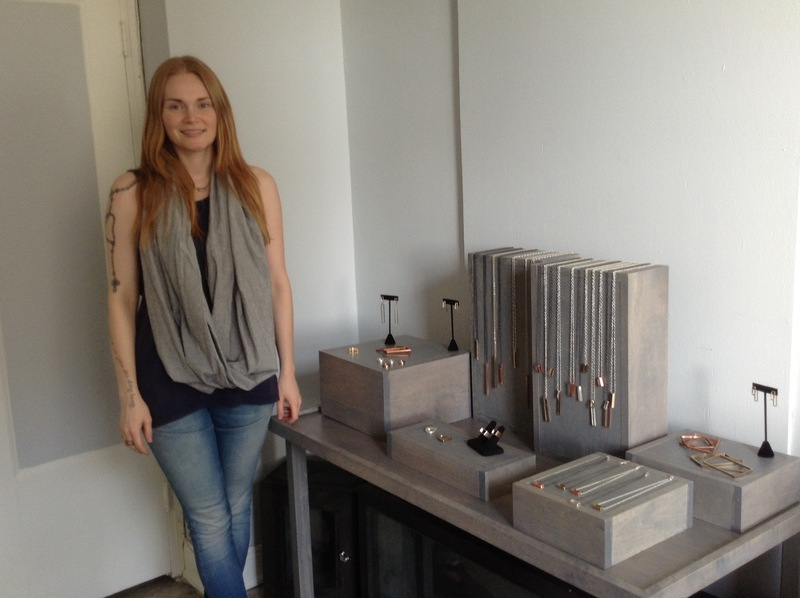 This hot new LA jeweler, fresh out of FIDM‘s Jewelry Design Program, has been surrounded by art her whole life. And a love of architecture is an obvious influence when looking at her work or even stepping into her studio space. I was struck by the impeccable design quality she is able to infuse into her cozy space in downtown’s fashion district. The single tall rectangular window, stretching up the near 20’ wall, echoes a selection of her pendents. I love that she sets herself there, in the midst of LA’s fashion designers and vendors, rather than in the jewelry district. The two work together, rather than isolation, when they work best, don’t they? Beyond creating stunning jewelry pieces with tremendous style, Lizz Roberts has dedicated herself to utilizing primarily repurposed sterling silver, copper, bronze, and soon gold. She also gives a portion of her proceeds to the LA Food Bank. In these ways, her creative process, tends to the earth and people in need. But, it is also her warmth and graciousness that brings much light. At the moment she opened the door to her studio, her easy-going smile filled the room. I became instantly enamored with her artistry and the aesthetic quality of her LZZR Reck collection. Each piece feels like it could be slipped on and infused into the natural expression of the wearer, never to be taken off again. I covet the entire collection, one by one. It won’t be long before her 2014 line will be launched. Take notice!